The Petmate Compass Kennel strives for a comfortable and safe experience for pets and peace of mind for pet parents. With the expandable entrance, pet parents can easily assist their pets entering and exiting the plastic kennel. The double-hinged door's turn-dial latches allow easy access for opening on either side, or for complete door removal. The top's slide-on design allows for easy assembly, snapping together in three simple steps, no tools required. Optional hardware is included for additional security. Ventilation openings allow for better visibility and fresh air on all sides, keeping pets comfortable during travel. The Petmate Kennel meets most airline cargo specifications, but pet parents should always check with their airline's specific requirements. 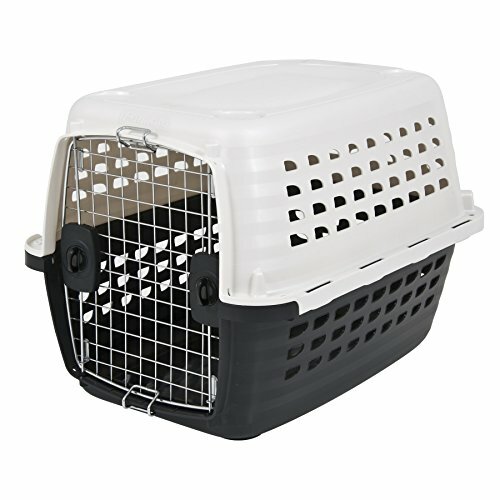 The color combination available for this kennel is Pearl White/Black. Kennel is offered in sizes ranging from 10-90 pounds. Made in the USA. If you have any questions about this product by Petmate, contact us by completing and submitting the form below. If you are looking for a specif part number, please include it with your message.